ecovery Explorer Professional is a utility for accessing and recovering lost files, formatted file system reconstruction, disk-on-disk data recovery and file system access after various cases of data loss or file system damage. The software can access and recover data of different types from the file systems of Microsoft Windows (FAT32/ExFAT/ NTFS), macOS (APFS, HFS+), Linux (Ext2/Ext3/Ext4, UFS/UFS2, XFS, Reiser, JFS), as well as Btrfs file system, SUN/FreeBSD ZFS file system, ESX(i) VMFS of Vmware. Moreover, supporting Apple Core Storage volumes, the program enables the user to perform data recovery from FusionDrive storages. The application is capable of scanning ordinary hard drives, as well as logical units organized into a RAID configuration. For data recovery specialists the software also offers diverse storage decryption methods, including the ones for FileVault2 root volumes. An embedded write-enabled hexadecimal editor allows users to correct the issues in the file system manually. Recovery Explorer Professional features extensive storage and data analysis methods, including the tools for low-level data consistency analysis. Operations management is enhanced with the help of separate tabs for each tool as well as the opportunity to preview the files to be recovered. The general recovery procedure includes optional storage scan, automatic or manual storage analysis, choosing the files for recovery and the recovery process itself. The speed of performance depends greatly on both the memory capacity of the storage and the size of files to be recovered. 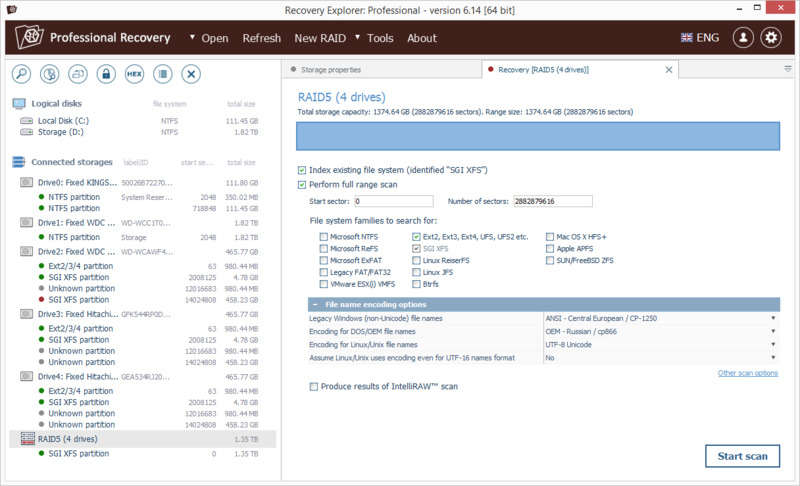 Being designed for advanced users, Recovery Explorer Professional can be also used by novices in the field of data recovery due to the clear and understandable user interface. The software has several licensing options depending on the purpose of use: from the free Trial License with the limitations on the size of files to be saved to the Personal, Business and Commercial licenses. At least 20MB free disk space for software executable files; at least 1GB RAM. Enhanced structure reconstruction on NTFS file system after scan; Added setting to skip automatically objects that cannot be created during copying.